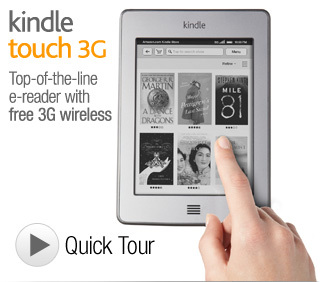 For Kindle Touch, Amazon invented X-Ray–a new feature that lets customers explore the "bones of the book." With a single tap, readers can see all the passages across a book that mention ideas, fictional characters, historical figures, places or topics that interest them, as well as more detailed descriptions from Wikipedia and Shelfari, Amazon’s community-powered encyclopedia for book lovers. Amazon built X-Ray using its expertise in language processing and machine learning, access to significant storage and computing resources with Amazon S3 and EC2, and a deep library of book and character information. The vision is to have every important phrase in every book. Hmm, OK, tapping a word is a bit easier than typing on the tiny keyboard. "Descriptions from Wiki and Shelfari"; how would that work? I know S3 and EC2 refer to the online information cloud; does that mean every search would automatically access the internet? Even if I only want to know who had lunch with the victim last Monday in this specific book? That could be a bit overwhelming. Add annotations to text, just like you might write in the margins of a book, with a virtual keyboard that appears just when you need it. And because it is digital, you can edit, delete, and export your notes. With memories of Sister MM thundering "Defacing a book, are we, Miss?" and wielding her yardstick I have always felt constrained from making marginal notes, even in books I own. Sadly, with paper books, only Post-its have been available for the purpose (or very light pencil). This feature is very clunky on my present e-reader. If they have managed to streamline it, I'd be thrilled, but haven't found a video or good description of of that feature yet. I'll keep watching. Let's see if they have done anything with page numbering. Discussing a book with someone who is reading a paper copy when I have the e-book can be a real challenge. Aha, found it! Easily reference and cite passages or read alongside others in a book club or class with real page numbers. Using the computing fabric of Amazon Web Services, we've created algorithms that match specific text in a Kindle book to the corresponding text in a print book, to identify the correct, "real" page number to display. Available on tens of thousands of our most popular Kindle books, including the top 100 bestselling books in the Kindle Store that have matching print editions. Page numbers are displayed when you touch the top of the screen. Oh frabjous day, that did it. Someone was listening when we moaned and complained on the fora and to Customer Service. So I'm in line now, with an expected ship date just before Thanksgiving. But I'll be keeping a weather eye on the fora to see how these new features are working out. When did simple reading get so complex? The whole world of ereaders is mutating like crazy. And I see this Kindle Fire is supposed to be entering into the tablet wars. I'm just going to hunker down with my Nook and my used iPad (first generation) and, most important, my dead tree books, until it's over. Sister, the Fire has a back lit screen and NO 3G, so might be great for reading magazines or manga, but I prefer the soothing e-ink technology, which I can read for hours without headaches. I don't see the Fire as quite a tablet like the iPad. There's a whole finely nuanced world opening between computers and ereaders. I may buy this one, but my next will have to do the laundry AND balance the checkbook. I am not quite clear on how to find passages in a Kindle book and words like 'algorithm' make me nervous but this is surely a start. I have a visual memory that lets me recall just where on a certain page e.i. middle, top or bottom, right or left my info is and so having page numbers may also be a help. MC, to search you pull up the menu, select 'search', fill in your term, and it will find every instance of the term in the book. I have only used it with exact nouns or terms. I suspect it gets a bit strange with more complicated concepts. It might be fun to try. I also remember passages by position, but apparently don't even notice the location indicator subconsciously. The new Fire ereader is a lot heavier than the 3rd gen Kindle----and lower weight was what finally tipped me into buying one. I probably won't be buying one---- even though the color is a plus. BUT I don't need all the bells and whistles that Fire offers. I want something to read a book or magazine on--- that's all. Will Amazon start their version of 'like' and 'Friend'? If so----- Boo Hiss. I just hate all that "like" and "friending" stuff. And don't get me started on twitter! The thing I don't like about e-readers is how small they are. LIghtweight is great, but I prefer more reading real estate. That's why I've taken to reading books on the iPad. The backlighting is great in certain circumstances, but it does get to be a strain. MC, I have a visual memory for where I saw something in a book too. I try to bookmark things when I'm using an e-reader, but what you think you want to mark while you're reading so often isn't what you wish you could find once you get to the end. It's always something. Cave76, does your K3 have page numbering? That's really the feature I want. Twitter seems to me like the biggest waste of time in the world. I don't need to follow anyone else's stream of consciousness, my own is problematic enough. Every morning when I walk my dog, I see people jogging, walking, talking or texting on their phones or listening to their ear buds. They are everywhere but where they are. I have to wonder: are they so bored with themselves that they can't bear to spend a little time in their own company? How sad. Joyce and Pynchon may have been great authors (I couldn't get through them. My bad?) but they had some 'thoughts' and brains in their heads. Twitter, for the most part, is just people twittering about nothing. BTW---- just finished book two in the Hunger Games trilogy (Catching Fire) One more to go---- Mockingjay. I'm completely captivated by them! Is anyone else reading them? I was just thinking the other day how great this trilogy would be as a movie (IF done right!) I was thinking maybe Spielberg but lo and behold----- I just read that Lionsgate is making it---- for release in the UK in 2012!!! I SO hope that it keeps the flavor of the book. Oh! Cave76, I had Suzanne Collins, author of the Hunger Games, confused with the blockbuster chick-lit author. A near future post apocalyptic rework of the Theseus theme sounds much more interesting. Trawling the Amazon Author threads yesterday, I found one who is writing ebooks based on the minor characters from Homer. I'll have to find his post again. It really is time for a new ereader; my poor K2 is charging again, the battery slowly dying of overwork. Periphera asked if my K3 had page numbers. I still haven't looked for page numbers. I forgot while I was trying to locate something on a finished ebook and did find the location number. I know that isn't what you asked----- just saying I forgot (then) and will try to remember the next time.